As a primary school enrichment programme teacher, Ms Mathana Subhas Balan thought that the misbehaving children she encountered were "just being naughty". Now an educational therapist at the Dyslexia Association of Singapore (DAS), the 26-year-old has come to realise that behavioural issues may be indicative of something deeper. "After I joined DAS, I realised that they may not be naughty; they may have a learning difference or other issues," she said. Yesterday, Ms Balan was one of 70 students of private school DAS Academy presented with diploma, postgraduate diploma and master's degree certificates in special education needs by outgoing Senior Parliamentary Secretary for Education and Manpower Hawazi Daipi. Ms Balan was among the pioneer batch of 17 to get the Specialist Diploma in Educational Therapy for finishing a year-long DAS in-house training programme for educational therapists, in a ceremony held at the Lifelong Learning Institute. She teaches English to primary school pupils with dyslexia at the DAS Learning Centre in Jurong Point mall, and the course has made her better equipped to manage her classroom. "Many of my students have ADHD (attention deficit hyperactivity disorder) and anger management issues," she said. "Through the course, I've learnt to not let my emotions come into play when a child acts up or throws tantrums, and I know how to handle the situation now." 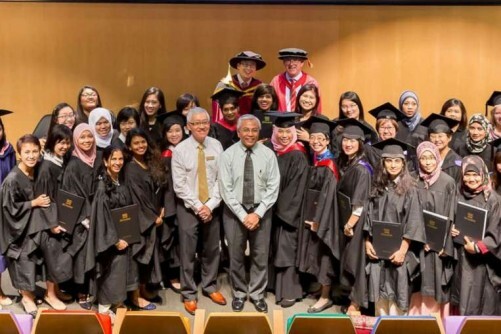 Ms Evelyn Koh, who earned her Postgraduate Diploma in Special Educational Needs, has noticed a rise in the number of children diagnosed with special needs during her decade as a pre-school teacher. "This prompted me to want to be able to identify pre-school children who need extra help and provide them with support," she said. Ms Balan added: "Teachers in mainstream schools may encounter children with special needs and not know. This training can help you identify the issues, and understand children better."